What if my dog ​​does not let him brush his teeth? Why cheat us, our dogs love us very much, but as soon as they see us with something in their hand related to their hygiene, they run away. If your dog does not allow you to brush your teeth, see these practical tips that can help you get it. We already know that dogs often need to be tricked into getting what we want from them. If your dog does not allow you to wash your teeth wait for a moment when you are calm, maybe in your lap, and start caressing him near his mouth. Then you could begin to examine your teeth, to later try to give it with a gauze previously moistened with toothpaste. In this position it will be much easier. There are two ways in which you can brush your dog's teeth. One is with gauze and another with a brush. 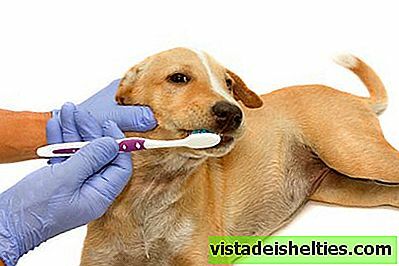 The best thing to start with, and especially if the dog does not allow you to brush your teeth, is the gauze method. The gauze creates less pressure and can be more comfortable. It has to be said that It is less effective than the brush, but to begin to enter your pet in the world of dental hygiene will be enough. If you decide for a brush, choose one that is of soft bristles and that has anatomical shape so that it adapts to the shape of your pet's teeth. So it is easier for him to accept the fact that tooth cleaning will begin to be part of his life. The next step is pasta. Maybe your dog does not allow you to wash your teeth because the smell or taste of the toothpaste you have bought is too strong. Remember that You should never use toothpaste for people with your dog.In veterinary stores there is a wide variety, some even without odor or taste to accept them more easily. Be careful with the manner and intensity with which you clean your dog's teeth, Especially if it's one of the first times you do it. Try to be soft and do not stop talking to him in a light way and caress him while doing it; Your pet will feel relaxed and next time will be more willing to let you brush your teeth again. When dogs refuse to do something, it is because they relate it to a negative question. When you have finished brushing your dog's teeth do not forget to reward him. Give him one of his favorite treats or a piece of food that he loves. In this way, will associate the process with something positive and it could even be he who comes next time to look for you with the brush in his mouth. In addition to a physical prize, A dog needs your recognition to feel good and know that you have your approval. Give him pampering and words of encouragement telling him that he is a good boy, how well he has behaved and how much you love him. Surely your dog will thank you and the next will be more willing to show your teeth, in a good clear sense. You see that with patience and a bit of doggy psychology you can get anything from your pet. Effort, perseverance and affection are the keys.